As we head closer to Sony's Mobile World Congress press event later this month, new details about the Sony Xperia XA3, one of the phones expected to be announced by the Japanese company, have surfaced online. 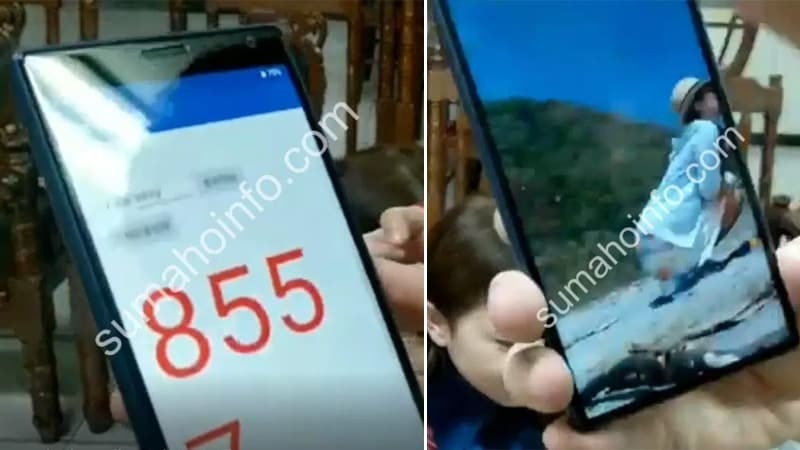 The phone, rumoured to boast a 21:9 aspect ratio CinemaWide display, has been sighted in the leaked screen grabs from a live video that claims to show the Sony Xperia XA3 in all its glory. Interestingly, the leaked images of the phone line up with the details shared in the previous leaks. The CinemaWide display was originally expected on the company's Xperia XZ4 flagship phone, which too is rumoured to be showcased this MWC. New images that claim to showcase the Sony Xperia XA3 have surfaced courtesy sumahoinfo.com. Though nowhere as clear as the previously leaked renders, these screengrabs from a live video chat reveal a Sony smartphone with an unusually tall display. The rear camera placement too is in line with the earlier leaked render - a horizontal dual camera setup with an LED flash above. If rumours are true then at least one of these cameras is likely to be 23-megapixel. You can also spot three physical buttons on the right of the device, which would be for power and volume control. There's also a dedicated fingerprint scanner between the power and volume control buttons. This leak was first reported by GSMArena.com. This CinemaWide display is said to have a full-HD+ resolution of 1080x2560 pixels with screen sizes for the XA3 and XA3 Ultra at 5.9-inch and 6.5-inch, respectively, as reported by GSMArena.com. As per the previously leaked renders, the phone may be offered in four colour options - Black, Blue, Pink, and Silver. It would reportedly feature a USB Type-C port at the bottom with speakers on either side. It is likely to be powered by Qualcomm Snapdragon 660 SoC, coupled with 6GB of RAM and 64GB of inbuilt storage. Android 9 Pie will handle things on the software side. As we mentioned earlier, Sony is hosting a press event, scheduled for February 25, 2019, at MWC 2019 in Barcelona. It is very likely that we will hear about the Xperia XA3 at this event.